Great news! I will be returning to Maison des Arts Créteil yet again this coming November for the Festival D’Automne. I think this makes the 4th show I’ve toured to the Festival D’Automne in Paris and I’m excited and honored to be a part of another original creation representing the best in contemporary American performance. 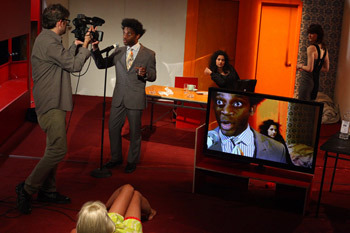 WORLD OF WIRES adapted by Jay Scheib, 2012 Obie winner, is set to storm the city of light November 13-17, 2012. World of Wires is the third part of a trilogy entitled “Simulated Cities/Simulated Systems”, created by Jay Scheib at MIT and based on a 1973 science-fiction television series directed by Rainer Werner Fassbinder. Scheib, an author, opera composer and stage director, worked jointly with engineers and computer scientists to build a complex performance which challenges our perception of reality.